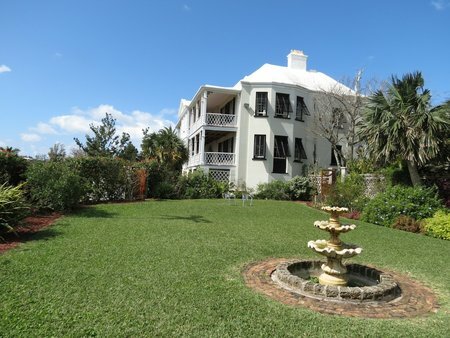 Located inside Botanical Gardens of Bermuda with sprawling lawns and flower gardens, Camden House is the official residence of Bermuda's Premier. The Premier actually does not live here and uses another Government funded property for residence. The Camden House, which was built in the early 1700s with typical Georgian architecture, is used mainly for public functions and VIPs. One of the popular annual functions held at the garden of Camden House is the Carol Service in December. The carol features local choirs and bands, and also attended by the premier and governor of Bermuda. Some of the special dignitaries who have visited the house and dined here includes the former British Prime Minister Margaret Thatcher, Princess Margaret, former U.S. secretary of state General Colin Powell etc. The house has open balconies at the two upper levels that have wonderful views of the south shore. As you go to the second level using the cedar staircase, you will see portraits of the former Premiers of Bermuda. Camden House, built around 1714, was purchased by Francis Jones, son of Colonel Thomas Jones of Paget Parish. He lived here till 1796 when he died of Yellow Fever. Subsequently the house was bought over by Henry James Tucker in 1823 who was the Mayor of Hamilton City between 1851 to 1870. During his time, he also built an arrowroot factory behind the house, which is now occupied by the art gallery Masterworks Foundation. In 1966 the Camden House became a government property open to public with its historic exhibits and treasures. A hand carved cedar panel in the dining room with 'Bird's Eye' and having intricate grains. It took some 30 years for a cabinet maker to complete this and the other cedar furniture in the dining room in the 1800s. Cedar Tables and chairs in the dining room with seating provision for 24 persons. Stunning Waterford crystal chandelier in the drawing room. The Sheraton console table (of 1790s) and the cedar chest (of 1750s) are worth noting as well. There are Adam style fireplaces at both end of the drawing room. Next to the Drawing room is the study which has cedar make bookshelves with lots of books in them. The curator opens the house for public tours between 12 noon - 2pm on Tuesdays and Fridays, provided there are no official functions taking place. There is no admission fee. Take Berry Hill Road, at the roundabout you will find the entrance to Botanical Gardens where the Camden House is located. Address: Bermuda Botanical Gardens, 169 South Road, Paget. Phone: 441/ 236-5732. Bus routes: #1, 2 and 7. 2) Check out Paget Parish to know about all the attractions in Paget.